154 Hidden Court: Our summer with Harry Potter. Our summer with Harry Potter. I'm a self-proclaimed book nerd (of course) and seriously, one of my biggest parenting challenges has been trying to wait until they're age appropriate/reading level appropriate to introduce some of my favorite books to my boys. 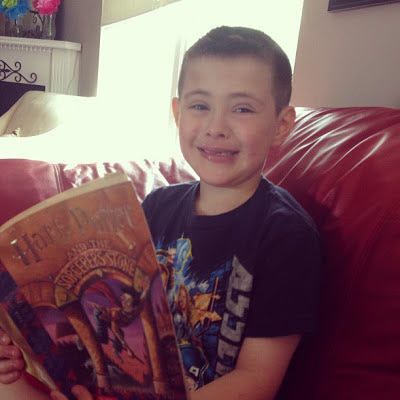 But since Zachary has proven to be a really good reader and since I simply couldn't stand to wait any longer, I decided that he and I would start reading Harry Potter this summer. Being the ridiculous, rampant over-planner that I am, I had it all worked out beforehand. There would be activities! There would be crafts! There would be worksheets! Every chapter would be a springboard for something wonderful and fun and complicated! We would make wands! We would make capes! We would drink butter beer and eat chocolate frogs and sort ourselves into houses! We would play Quiddich! We would learn spells! I even began to devise in my head a rather complex chore chart system that involved the houses. It's quite astonishing how clearly we all fit into particular houses - R is Slytherin, I'm Ravenclaw, Zachary is Griffindor and Cooper is Hufflepuff, of course - so I was planning to run around all summer yelling "Socks on the floor? Ten points from Slytherin!" and "Vacuuming done? Twenty points for Ravenclaw!" And then we started reading. We finished the first chapter and I was starting to get up to go get our worksheets when Zachary said, "One more chapter? Please Mama?" So we read one more chapter. And another after that. Somewhere along the way, as we were meeting Hagrid and going to Gringott's and learning to hate the Dursleys, it occurred to me that maybe, just maybe, we didn't need anything more than a good book, an eager reader, a happy Mama and a long summer afternoon to make it a special experience. How old is he? I waited anxiously for the girl I babysit to be interested in HP but at age 9 the second book is terrifying her and I can't get her to read with me anymore. We cruised through the first, stopping occasionally when it got intense but the second is proving to be too scary :( maybe next year. He's seven, but seriously? This kid isn't afraid of anything. We are just getting ready to start the second one. I'll let you know how it goes. Yes, he's a mini-me nerd. And I love him so much for it. Stacey, in my former life I was a bookstore manager, and the single best part of my job was watching a kid go from "I hate to read!" to "That book might be ok" to "When is the next one coming out?" There's SOMETHING out there he will like to read - don't give up! All your planned activities will come in handy in between books. It really bugs me that my husband hasn't read the books. He's seen all the movies, and I get annoyed at him because of all the extra stuff that was in the books that he totally missed. He's finally reading them aloud to me, so there may be hope for him yet. Yay! I'm glad he's finally reading them! I had forgotten just how clever they are until I started re-reading thing with Zachary. Books are always better than the movies! I believe I will link up. Thanks for finding me and bringing it to my attention!